<h2>Crash test dummies based on older bodies could reduce road fatalities</h2><br /><p>When looking at the bare statistics, Europe’s roads seem to be getting safer.&nbsp;Over the past seven years, the overall number of road fatalities has gone down by 20%, yet, at the same time, the proportion of&nbsp;<a href="http://europa.eu/rapid/press-release_MEMO-18-2762_en.htm" target="_blank" rel="noopener noreferrer">older people injured or killed on the roads has risen</a>.&nbsp;</p> <p>With the percentage of people over the age of 80 expected to <a href="http://ec.europa.eu/eurostat/statistics-explained/index.php/Population_structure_and_ageing" target="_blank" rel="noopener noreferrer">increase to almost 30% by 2080</a>, this high rate of road accidents involving older people is likely to become a growing problem.</p> <p>But safety testing by the automotive industry currently does not take into account the distinct physical differences older drivers tend to have compared to those who are younger. Crash test dummies&nbsp;stand in for&nbsp;human drivers and passengers in safety tests are usually based on people between the ages of 20-65 years old.</p> <p>This means that many devices and pieces of equipment designed to make cars safer are potentially unable to provide optimal protection for a group of people who currently account for <a href="http://ec.europa.eu/eurostat/statistics-explained/index.php/Population_structure_and_ageing" target="_blank" rel="noopener noreferrer">almost a fifth of the population in Europe</a>.</p> <p>But a project called SENIORS is hoping to tackle this problem by developing a crash test dummy that perfectly replicates the bodies of older people.</p> <p>‘There’s bone differences, geometric differences and weight differences, so restraint systems really need to be adapted for older people to protect them better,’ said Mark Burleigh of crash test dummy manufacturer Humanetics Europe and design engineer for SENIORS. ‘Their muscles aren’t as strong, and they move in different ways before and during an accident.’</p> <p><strong>Organ positions</strong></p> <p>To create their senior citizen crash test dummy, Burleigh and his colleagues collected data to determine the statistically average person, and scanned the bodies of real people. MRI scans were used to further determine organ positions.</p> <p>They then combined this information to create a 3D-printed replica of a 70-year-old woman with a BMI of 29 and 1.61m in height, representing the average traits of the older people most commonly injured in road accidents. The dummy is currently being used for research, but Burleigh and his team hope that in the future it will be a requirement that all cars are tested using their dummy.</p> <p> <div class="quote-view quotesBlock quote_horizontal"> <div class="quotesTop"><img src="https://horizon-magazine.eu/sites/all/themes/horizon/images/quotes_top.png" alt="" title="" /></div> <p>'We are protecting younger people better than older people at the moment. '</p> <blockquote><p>Adria Ferrer, Project Manager, Applus+ IDIADA</p></blockquote> <div class="quotesBottom"><img src="https://horizon-magazine.eu/sites/all/themes/horizon/images/quotes_bottom.png" alt="" title="" /></div> </div> </p> <p>Adria Ferrer, of multinational engineering firm Applus+ IDIADA, who is the project manager for SENIORS, said: ‘We are protecting younger people better than older people at the moment. If you look at the rate in elderly fatalities, you can see that it is increasing, and the safety systems installed in the vehicles must be able to provide the same protection to older and younger people.’</p> <p>The project is also testing seatbelts that are specifically designed to protect the older body. The most commonly seen injuries in older motorists and passengers are in the chest, so the researchers looked at creating new kinds of seatbelts to prevent this.</p> <p>Generally, seatbelts are designed to follow the skeletal bone structure of the wearer, resting along the clavicle, ribs and the pelvis bones. In the event of an accident, the belt will put pressure on the bone, which will resist that pressure without causing internal damage. However, in overweight older people the belt can sit on the belly instead, and in the event of an accident will put pressure on their soft abdomen. &nbsp;</p> <p>One design the SENIORS team are investigating uses two straps criss-crossing over the body. They are also examining the effects of <a href="https://auto.howstuffworks.com/car-driving-safety/safety-regulatory-devices/seatbelt5.htm" target="_blank" rel="noopener noreferrer">load limiters</a> – devices used in most seatbelts to minimise injuries caused by the webbing – with different restraint systems to see what would work best for an older person’s body, without compromising on protection for everybody else.</p> <p>‘The challenge is to make vehicles safer for older people while maintaining the high level of safety for younger people,’ said Ferrer. ‘The same seatbelt must be able to protect an 18-year-old football player, who is sporty and physically fit, and a 70-year-old.’</p> <p><strong>Everyday driving</strong></p> <p>But the physical differences that separate older people from the rest of the population are not just important in the event of an accident – they can also inhibit everyday driving. As people get older, their eyesight and hearing become poorer, they have slower reactions to unexpected incidents and they cannot move as nimbly as a younger driver. To date, many systems in a car are not developed with older users in mind, and those people will often quit driving, limiting their independence.</p> <p>‘Ergonomic design studied in collaboration with senior drivers is key,’ said John Reiner, director of public-funded research projects for German company Infineon Technologies. ‘We have to implement technologies to compensate for the fact that younger drivers have better physical abilities and can move more easily, and also are less scared in stressful traffic situations.’</p> <p>He coordinates a project called SILVERSTREAM, which has developed an electric car that caters to the unique needs of older drivers. Comfort is vital, according to Reiner, as even getting into a car can be a painful experience.</p> <p>To address this, the SILVERSTREAM car has a front passenger seat that rotates around its centre and exits the car, coming to rest facing the driver. They can then sit into it with ease, without having to bend and twist their bodies. Once a person is sitting in the seat, it rotates and re-enters the vehicle.</p> <p>The boot of the car contains a crane-lift device to help motorists load heavy items. ‘As you become older, you need to have a little bit more comfort to get seated into the car, you want to carry your bags easily if you go shopping, said Reiner. ‘The car allows you to live your normal life, you can visit your friends and run your household.’</p> <p><strong>Dashboard</strong></p> <p>Instead of a ream of buttons bristling from the dashboard, the car also has a system that allows the driver to make hand gestures to interact with the onboard computer. It means the driver can simply wave in the air instead of reaching out to push tiny buttons or prodding and pulling switches.</p> <p>To reduce cognitive stress for the driver, it also includes only the barest essentials – providing the needed control information, but avoiding features like Bluetooth connectivity and USB chargers. According to the research carried out by the SILVERSTREAM team, older drivers don’t use the majority of such gadgets. By eliminating them, the price of the car can be reduced, and the aim of SILVERSTREAM is to have the car on the market for an affordable price – in the range of €8,000 – by 2021.</p> <p><em>The research in this article has been funded by the EU. If you liked this article, please consider sharing it on social media.</em></p> <p><a href="http://bit.ly/newsalertsignup" target="_blank" rel="noopener noreferrer"><img src="https://horizon-magazine.eu/sites/default/files/news-alert-final.jpg" alt="" width="983" height="222" /></a></p> <br /> <img src=”http://www.google-analytics.com/collect?v=1&tid=UA-40077089-1&cid=crash-test-dummies-based-on-older-bodies-could-reduce-road-fatalities&t=event&ec=republish&ea=read&el=crash-test-dummies-based-on-older-bodies-could-reduce-road-fatalities&cs=republish&cm=republish&cn=republish&cm1=1" /> This post <a href="https://horizon-magazine.eu/article/crash-test-dummies-based-older-bodies-could-reduce-road-fatalities.html">Crash test dummies based on older bodies could reduce road fatalities</a> was originally published on <a href="https://horizon-magazine.eu/">Horizon: the EU Research &amp; Innovation magazine | European Commission</a>. Europe’s population is ageing rapidly, yet the majority of car safety equipment is tested using dummies modelled on people under the age of 65. Now researchers are developing vehicles and equipment designed specifically for the physical attributes and abilities of older bodies. When looking at the bare statistics, Europe’s roads seem to be getting safer. Over the past seven years, the overall number of road fatalities has gone down by 20%, yet, at the same time, the proportion of older people injured or killed on the roads has risen. With the percentage of people over the age of 80 expected to increase to almost 30% by 2080, this high rate of road accidents involving older people is likely to become a growing problem. But safety testing by the automotive industry currently does not take into account the distinct physical differences older drivers tend to have compared to those who are younger. 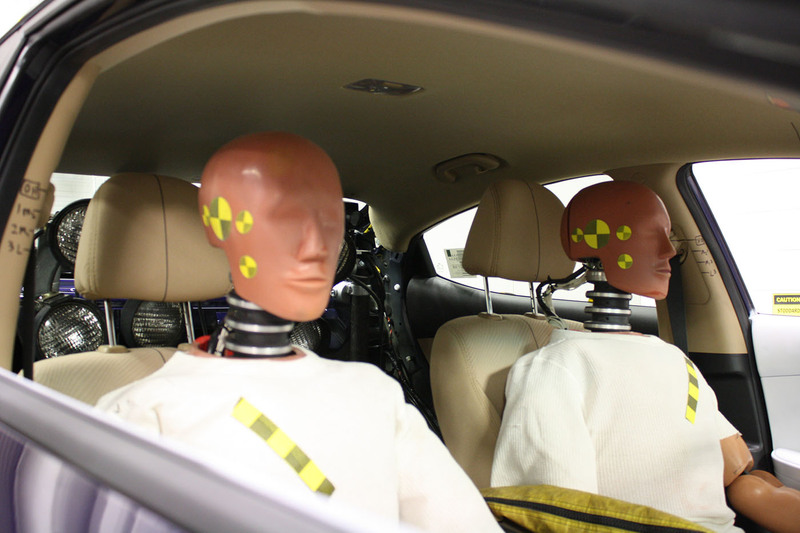 Crash test dummies stand in for human drivers and passengers in safety tests are usually based on people between the ages of 20-65 years old. This means that many devices and pieces of equipment designed to make cars safer are potentially unable to provide optimal protection for a group of people who currently account for almost a fifth of the population in Europe. But a project called SENIORS is hoping to tackle this problem by developing a crash test dummy that perfectly replicates the bodies of older people. To create their senior citizen crash test dummy, Burleigh and his colleagues collected data to determine the statistically average person, and scanned the bodies of real people. MRI scans were used to further determine organ positions. They then combined this information to create a 3D-printed replica of a 70-year-old woman with a BMI of 29 and 1.61m in height, representing the average traits of the older people most commonly injured in road accidents. The dummy is currently being used for research, but Burleigh and his team hope that in the future it will be a requirement that all cars are tested using their dummy. The project is also testing seatbelts that are specifically designed to protect the older body. The most commonly seen injuries in older motorists and passengers are in the chest, so the researchers looked at creating new kinds of seatbelts to prevent this. Generally, seatbelts are designed to follow the skeletal bone structure of the wearer, resting along the clavicle, ribs and the pelvis bones. In the event of an accident, the belt will put pressure on the bone, which will resist that pressure without causing internal damage. However, in overweight older people the belt can sit on the belly instead, and in the event of an accident will put pressure on their soft abdomen. One design the SENIORS team are investigating uses two straps criss-crossing over the body. They are also examining the effects of load limiters – devices used in most seatbelts to minimise injuries caused by the webbing – with different restraint systems to see what would work best for an older person’s body, without compromising on protection for everybody else. But the physical differences that separate older people from the rest of the population are not just important in the event of an accident – they can also inhibit everyday driving. As people get older, their eyesight and hearing become poorer, they have slower reactions to unexpected incidents and they cannot move as nimbly as a younger driver. To date, many systems in a car are not developed with older users in mind, and those people will often quit driving, limiting their independence. He coordinates a project called SILVERSTREAM, which has developed an electric car that caters to the unique needs of older drivers. Comfort is vital, according to Reiner, as even getting into a car can be a painful experience. To address this, the SILVERSTREAM car has a front passenger seat that rotates around its centre and exits the car, coming to rest facing the driver. They can then sit into it with ease, without having to bend and twist their bodies. Once a person is sitting in the seat, it rotates and re-enters the vehicle. Instead of a ream of buttons bristling from the dashboard, the car also has a system that allows the driver to make hand gestures to interact with the onboard computer. It means the driver can simply wave in the air instead of reaching out to push tiny buttons or prodding and pulling switches. To reduce cognitive stress for the driver, it also includes only the barest essentials – providing the needed control information, but avoiding features like Bluetooth connectivity and USB chargers. According to the research carried out by the SILVERSTREAM team, older drivers don’t use the majority of such gadgets. By eliminating them, the price of the car can be reduced, and the aim of SILVERSTREAM is to have the car on the market for an affordable price – in the range of €8,000 – by 2021.